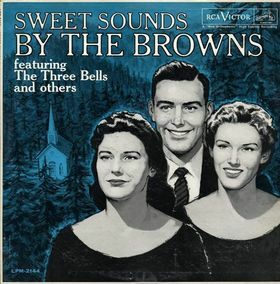 HomeClassic Country SinglesClassic Country Singles: The Browns, "The Three Bells"
When they finally went into the studio to record it in 1959, The Browns thought they were at the end of their recording career. They had just told RCA that the family act was breaking up, despite having enjoyed moderate success since 1954 with eight top fifteen singles. What was intended as their swan song became their signature instead, catapulting them into nationwide fame. Not only did it spend 10 weeks at #1 on the country singles chart, it also topped the pop chart for four weeks and even reached #10 on the R&B chart. “The Three Bells” came at a time when country music was enjoying its first major crossover success, topping the pop chart a few weeks after Johnny Horton (“The Battle of New Orleans”) and a few weeks before Marty Robbins (“El Paso.”) Robbins, Elvis Presley, Johnny Cash and The Everly Brothers dominated both the pop and country surveys, Guy Mitchell scored a #1 pop hit with his covers of “Heartaches By the Number”, and even two of the big pop stars of the day – Conway Twitty and Brenda Lee – would ultimately find their way to country music and make it their permanent home. Meanwhile, The Browns would fare better on the pop chart with their next two singles, but continued to be a presence on country radio until the sisters retired. The man who sang lead on the definitive three act country song would have three acts to his own career. After The Browns came to an end, Jim Ed Brown launched a successful solo career, with his 1967 hit “Pop a Top” becoming a bona fide classic later resurrected by Alan Jackson. As the solo hits began to wind down, he reinvented himself as one half of a duo with Helen Cornelius. Their 1976 debut collaboration “I Don’t Want to Have to Marry You” took Brown to the top of the singles chart for the first time since “The Three Bells”, and earned them both the CMA award for Vocal Duo in 1977. “The Three Bells” has crafted quite a legacy of its own, with versions released by everyone from Ray Charles, Alison Krauss, and Roy Orbison to Sha Na Na, Nana Mouskouri and Andy Williams. For modern country fans who haven’t encountered this classic yet, the structure will be instantly familiar. started listening to rock radio stations in NYC around 1957 so I recall hearing all the crossover artists and hits you mentioned. My favorite act by far was the Everly Brothers. I still have the old Cadence 45’s and some of their LP’s. This is one of my favourite songs of all time. I particually like Alisons version. I also always wondered if it was a coincidence that the name of the character in the song was the same as Jim Ed Browns or if it was written for him, this article clears that up. I wonder if the same name is what drew them to the song in the first place.